Home > Creative > What Exactly is Decorative Concrete ? Decorative concrete is traditional concrete that is modified, using mechanical techniques and environmentally-friendly chemicals to transform the surface appearance and make concrete look like a variety of other materials, such as brick, marble, granite, tile, slate, and even wood. Best of all decorative concrete can be made waterproof and slip-resistance and repairs easily. 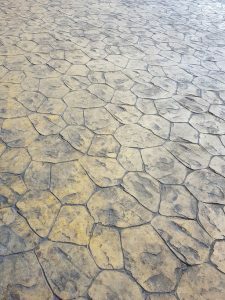 Decorative concrete has many uses, both indoors and out. Use it for walkways, seating areas, outdoor countertops, grill areas, and around your pool. Inside your home, decorative concrete can be used for flooring, kitchen and bathroom countertops, walls, fireplace and woodstove surrounds, and bartops, to name just a few uses. While decorative concrete is a little more expensive than traditional concrete, it is a highly cost-efficient alternative for property owners who want to achieve the look of more expensive materials while retaining all the benefits and durability of concrete. The decorative concrete experts here at Concrete Solutions, with products from Brickform and Solomon Colors, are happy to provide you with great interior and exterior design ideas to create your own decorative concrete look. Contact us today.